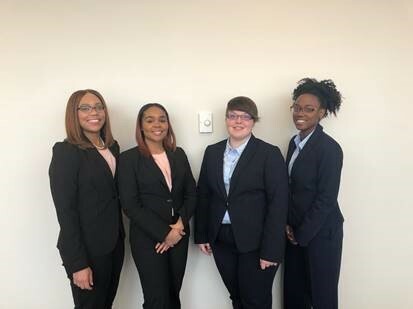 Christian Rice, Jalyn Hewitt, Cailyn Butler, and Sabrina Castille, all 2nd year UK Law students and members of the Black Law Students Association (BLSA), recently competed in the Thurgood Marshall Mock Trial Competition in St. Louis, Missouri. The competition was in conjunction with the 2018 Midwest Black Law Student Association Regional Convention. The Thurgood Marshall Mock Trial Competition is one of the cornerstones of the National Black Law Students Association (NBLSA) programming, and provides students with excellent training in trial advocacy. Participants have the opportunity to develop strong courtroom skills and argue issues that are at the forefront of debate in the legal profession. "The competition was a great experience! It was an honor to be a part of the first BLSA mock trial team to go to the competition in more than five years. It was a lot of hard work, but I wouldn't trade my experience for anything. I would definitely love to participate again next year!" said Jayln Hewitt. The UK Law students worked hard in preparation for the competition. A special thanks goes to their volunteer coaches from the legal community, Daniel Whitley, Kentucky Department of Public Advocacy, Amanda Parker, Fayette County Attorney's Office, and Rawl Kazee, a local practitioner. "It was a pleasure to work with these four students. Their great work ethic and solid foundation from the classroom were evident. UK Law should be proud," said Daniel Whitley. "I am confident these students are able to compete with any law school in the nation." UK College of Law makes it a priority to provide opportunities for its students to participate in competitions, allowing them to take their training from the classroom, along with research and writing, and apply their skills in simulated experiences. "We are committed to opportunities for our students to become practice-ready upon graduation. Every day, as I observe our students hard at work, I know the future of the legal profession is in good hands," said UK College of Law Dean David A. Brennen.